Our music program consists of an exciting blend of traditional hymns and contemporary Christian praise music. 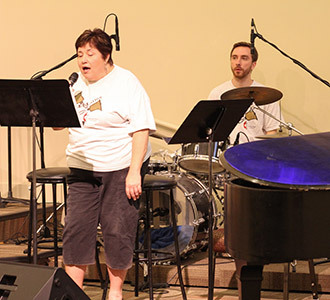 Each Sunday you will see a worship band consisting of fine professional musicians and vocalists. Our group strives for musical excellence with a common goal to share the love and joy of our Lord. Once a month during the school year season we are joined by our fine bell choir “JubBELLation”. 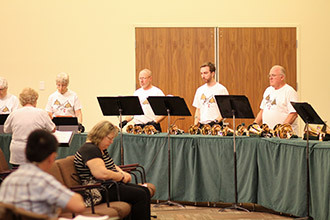 If you have never seen a bell choir perform, you will marvel at the precision of all the different bells coming together to create one cohesive sound. 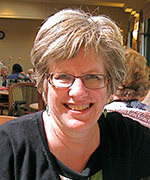 The group is proud to have Darlene Woodburn as their director. As well as being an excellent bell choir director, she also directs three other vocal choirs in Scotts Valley. Our Church Chorus performs at Advent, Christmas Eve, Martin Luther King Day, and Easter Sunday, singing great contemporary arrangements composed locally and backed up by a full band, as well as traditional pieces with keyboard accompaniment. Our group is open to all who like to sing and to those who would like to learn to sing as well! What does it mean to learn how to reach out to the world? Get some fishing tips form Jesus! Join us as we celebrate the lighter side of faith – it will have fun-filled songs, a merry attitude, with a heartfelt message. We’ll celebrate women of faith. From the earliest point of the church, women have been crucial to the faith. 1. Street parking — most meters in our immediate neighborhood are “off” on Sundays. 2. The city parking garage at 55 North 5th Street (half a block from our front door). When you enter the garage, take a ticket; but the exit gate will rise for you even if you do not put in a ticket or money. 1. There are 8 spaces for the church staff and visitors in the lot at 80 North 5th Street (not available on Sundays). 2. Street parking is $2/hour, but becomes free after 6:00pm. 3. The city parking garage at 55 North 5th Street is free after 6:00pm. Exit CA-87 at W Julian St. Head east on W Julian St, which becomes E St. James St. Make a right onto N 5th St. San Jose First United Methodist Church will be on your left at the corner of 5th and Santa Clara Streets. Exit I-280 at 10th/11th St. Turn onto 11th Street heading north. Turn left onto E Santa Clara St. San Jose First United Methodist Church will be on your right at the corner of 5th and Santa Clara Streets.